I thought I’d open this blog with one of those typical ‘no use at all, until its useful’ articles – the kind you see on Lifehacker. Indeed, some of these ideas are from Lifehacker, I just can’t remember which. Others I have discovered myself, though doubtless others have done so too. So here we go. A real simple, if not exactly stylish one. 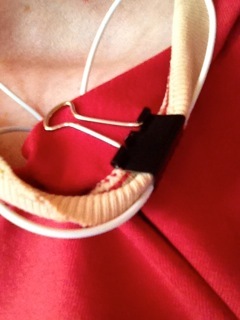 Simply clip the earphone cable to the hem around the neck of your shirt or tee. It secures a fixed length of slack cable between the clip and your ears and stops that annoyance of earbuds being pulled out every time you turn your head because the slack has fallen down inside your shirt. 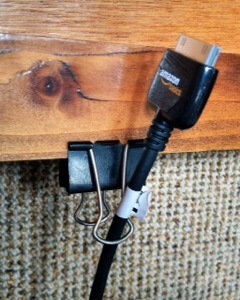 This might work in all sorts of other places too, basically anywhere with enough of a lip to stick a bulldog clip onto. 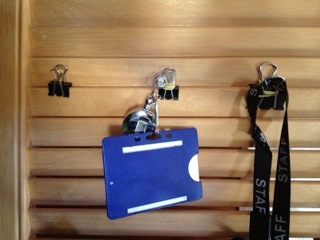 Simply clip the bulldog clip to the louvered edge and hang pocket torches, keyrings, ID badges etc from the lowermost handle of the clip. You need to bind the two clip handles together with an elastic band to prevent that lower one from unfolding under the weight of the hanging object. 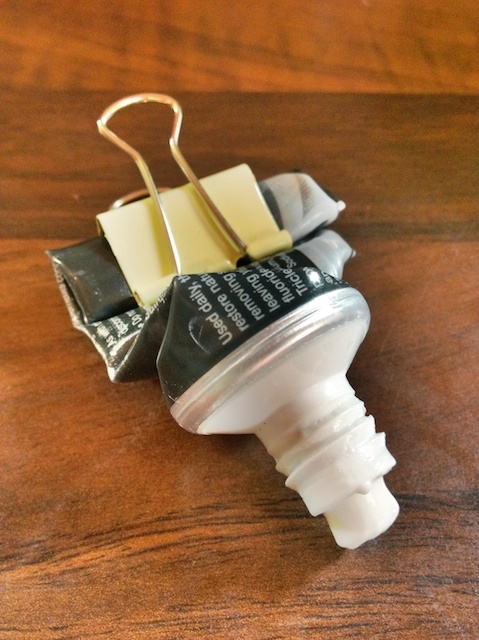 This one is straight from Lifehacker. Personally, I don’t think it would work very well as the merest gust of wind would blow all your photos over whenever you opened a window. The idea is to clip 2 or more bulldog clips to the bottom of a photo then open up the clip handles and hold the photo between them. 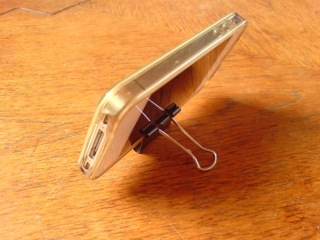 You can also fold the clip handles the other way, so that they are acting like legs, suspending your photo a little higher of the shelf. Maybe use this idea to pop a message of love on your beloved’s bedside table while they sleep (cute, or creepy if they don’t actually know you). Again, not one for gusty environments but a quick and easy adapter when you just have to have that Hipstomatic photo of the bridal party. This one is best explained by Playstationfive on this website. You’ll need two large-sized bulldog clips. 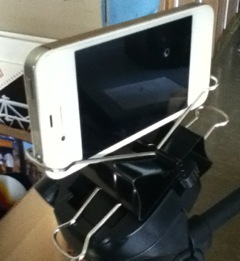 Staying on a tripod theme, if you clamp a inch-wide bulldog clip to an iPhone, and splay the clip handles as supports, you get a stand that lets you angle your device through several viewing/photographing angles. Maybe I should paint one white and sell it for $25. 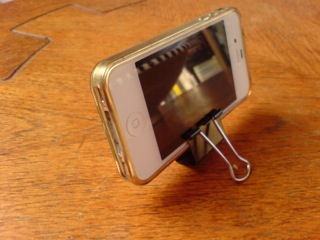 No doubt this would work for a variety of smartphones. This one is from another site but I can’t remember which. Attach a small bulldog clip to your keyring, via the clip’s handles and clip it to anything that you need to remember to take out with you the next time you leave the house (letter to post, shopping list, another set of keys even). 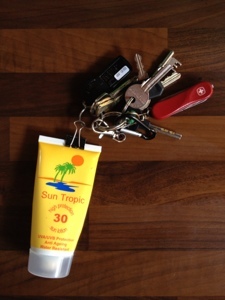 It also allows you to clip the keyring inside a handbag or messenger bag, to the lip of a inner-pocket. This also works for those Sharpie marker pens designed to go on a keyring. If you put such a pen onto a bulldog clip instead, you can clip it to the edge of a noticeboard so that it doesn’t get lost. Ever have a bag of flour or ground coffee spill over in the cupboard? Power everywhere! I’ll ignore the fact that you are not keeping your coffee in the freezer for maximum longevity (foolish, foolish reader!) 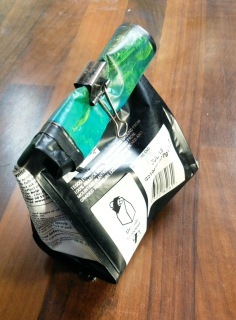 and suggest you try rolling up the open end of the bag and clipping the roll with….you guessed it, a bulldog clip. If you then fold the clip handles down against the bag, there are no sticky-out bits to catch on your sleeves as you are dipping in and out of the cupboard for biscuits. Okay, this one has been covered ad infinitum elsewhere and I’ll not go into what a Hipster PDA is in any depth (its basically a quick and dirty GTD solution; you can get the lowdown on Wikipedia, or in it’s inventor’s own words). 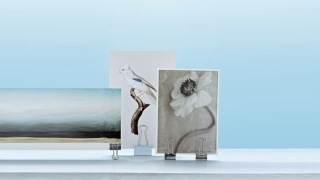 If you have a bunch of index cards, sheets of paper, photos etc that you need to group together for whatever reason, a bulldog clip is a handy, non-destructive, non-sticky means of doing so. 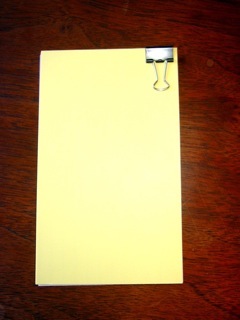 I guess this is why Americans call them ‘binder’ clips. In the UK we only use them for pinning-up our guard-dogs when not in use. You want to cook some rice or pasta quickly. So you leave the lid on the pan but find the contents keep boiling over onto your nice clean hob (notice how I cropped the state of my hob out of the photo). 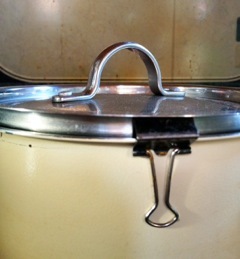 You try the old trick of putting the lid on slightly askew to let the steam escape but the motion from the bubbling keeps sliding it back into place. What to do? Blow £11 on this comical ‘Lid Sid’ fellow, or reach for a trusty bulldog clip? Bulldog clips are so versatile, its worth carrying one around, they clip almost unnoticed to the edge of a bag’s inner pocket after all. Feel free to suggest anymore and I’ll add them to the list. 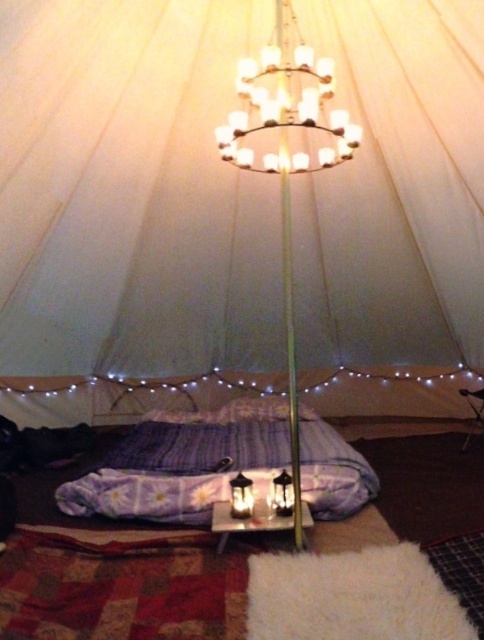 Got yourself a lovely new bell tent (or any other tent for that matter)? Glamp out with some solar powered fairy lights. Most tents have tabs or hems dotted around their interior for you to string the lights between. If you want them around the outside, string them between the guy-rope attachment points. How do you attach them? Chewing gum. No, bulldog clips – but I had you going there for a second, didn’t I?